Summer 2017 is Here - - PAGE 415. Summer 2017 is Here· · PAGE 415. 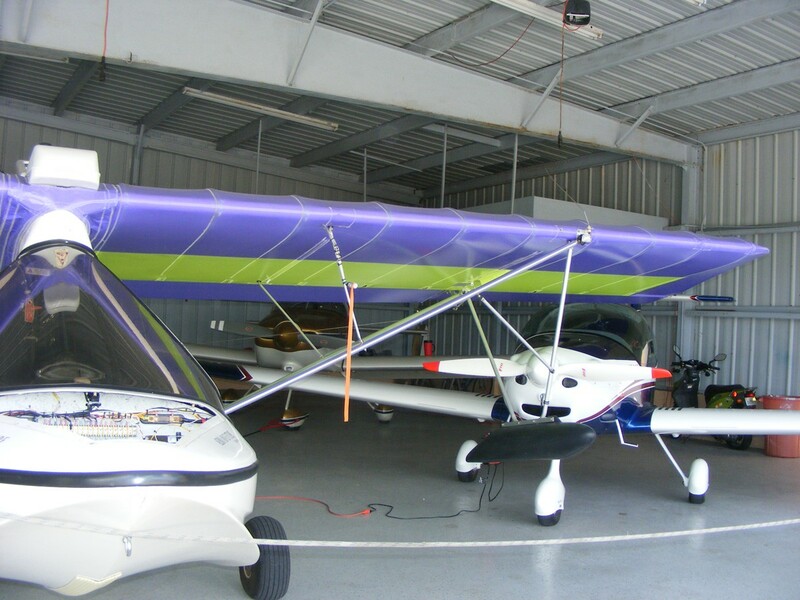 Billy had FIVE airplanes stuffed in the hangar and it was too hot to worry about pulling out two of them just to get mine out for a hot flight. I double-checked my headphone wires to consider if I should shorten them any when I install the heat shrink tubing to replace the cracked and broken insulation on the wires from the plugs to the volume control box. 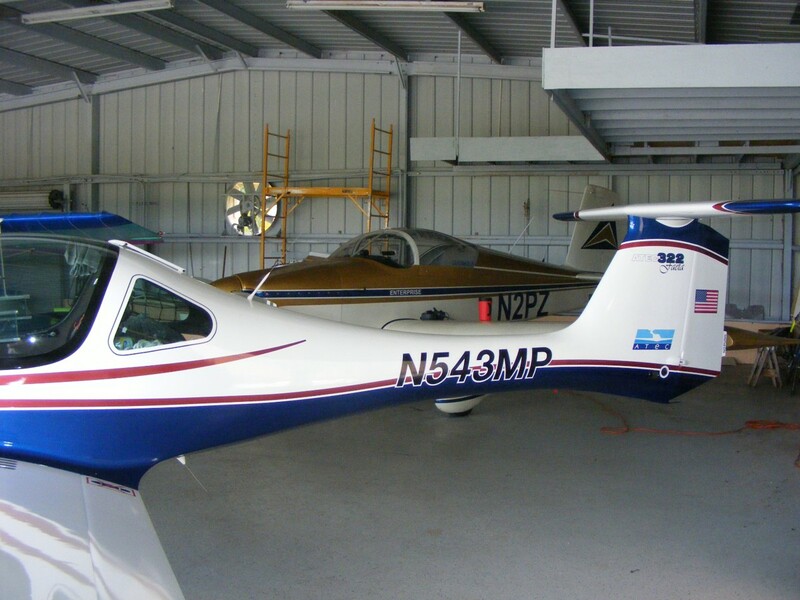 You can see my airplane is in the usual spot back in the southeast corner of the hangar. 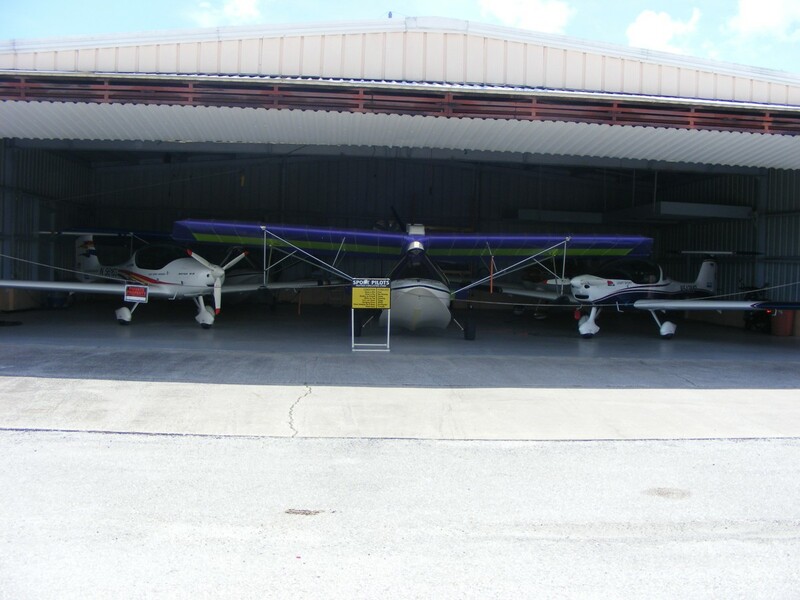 There are two Aventura II amphibian aircraft in the hangar. One is front and center with another one back in the northeast corner of the hangar. 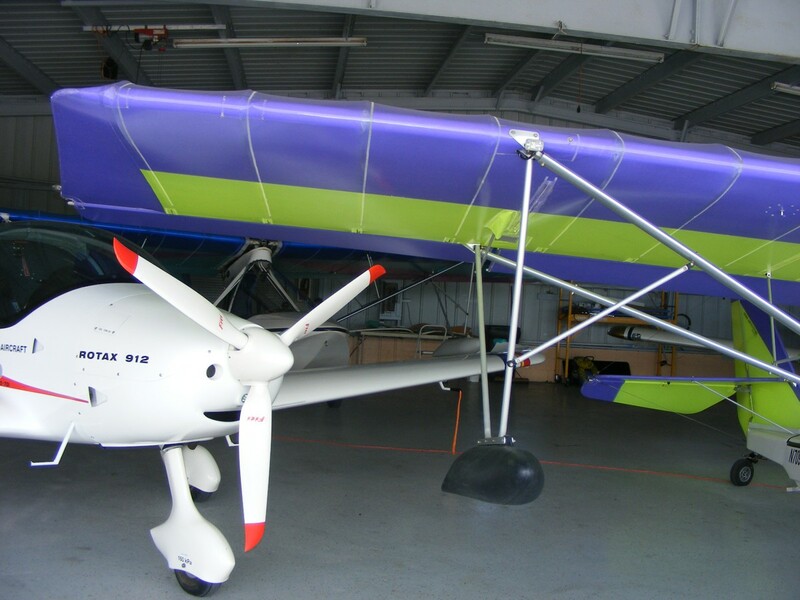 The ATEC 322 Faeta light sport airplanes are in the front corners of the hangar. 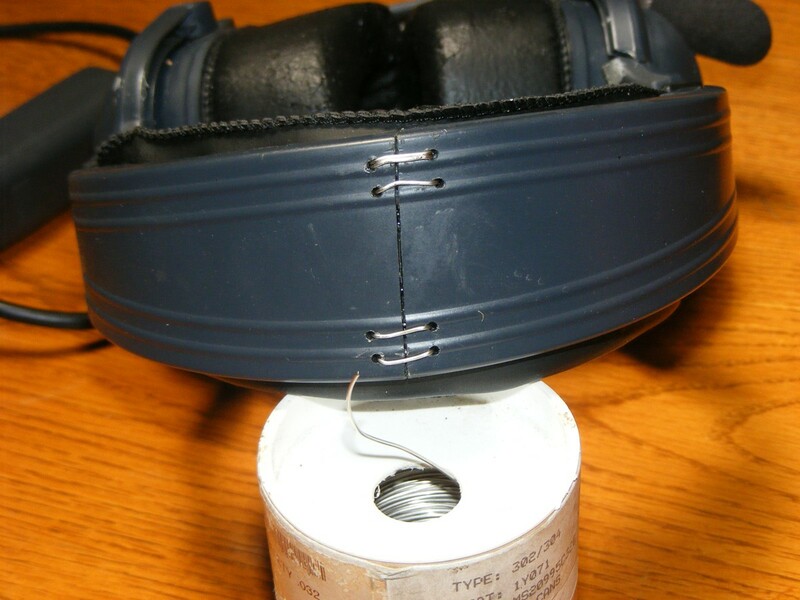 Here is how my headphones look after the heat shrink insulation was installed. All the remaining factory insulation between the control box and the audio plugs was stripped off the wires before the heat shrink tubes were installed. Over half of that insulation had already crumbled. July 1, 2017: I took the headset with me to the airport Saturday morning and hoped I would get in another short flight. Bill was not there and the five airplanes were still in the hangar. 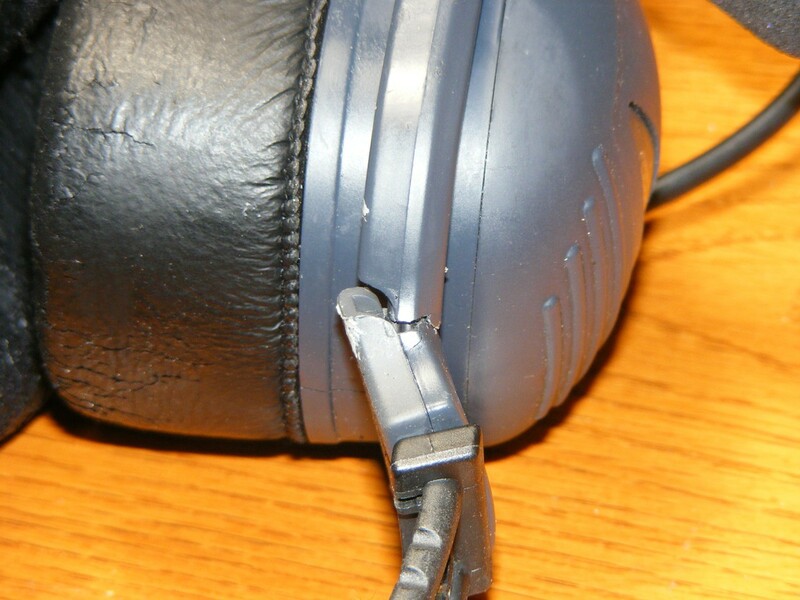 I sat down in my airplane to check out the headphone wiring repair I did last week. Everything works perfectly. I did the grocery shopping and was back home by lunch time. 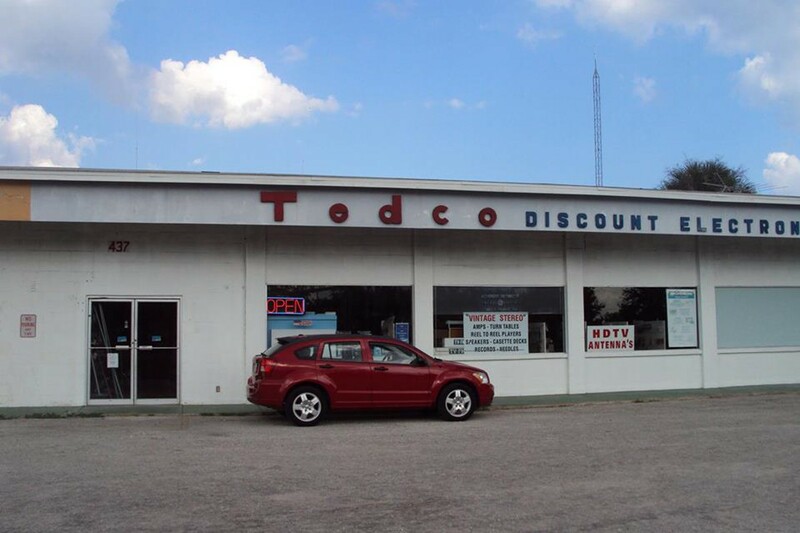 I spent most of the afternoon at an auto repair shop getting rear brake calipers, rotor discs, and brake pads for the old Caddy. I always love the light touch on the steering when the car has new tires. Two of the old tires had dry rot along the edges of the tread. I watched most of the movie "The Spirit of Saint Louis" on Turner Classic Movies channel when I was waiting for the repairs to be completed. July 2, 2017: I stayed home on this Sunday to work on my Light Speed 20 XLC headsets. Today I tried to shrink the new insulation on the wires seen in the image above with no success using a 1000-watt hair dryer. Maybe one of my friends here locally has a heat gun made for this job. I also got out my second 20 XLC headset that has broken "stirrups" that connect to the ear cups, and a broken plastic piece that fits over the metal strap across the top of my head. I ended up using safety wire to do that job. I used my safety wire twister on the inside and laid the wires down against the inside of the large plastic piece. 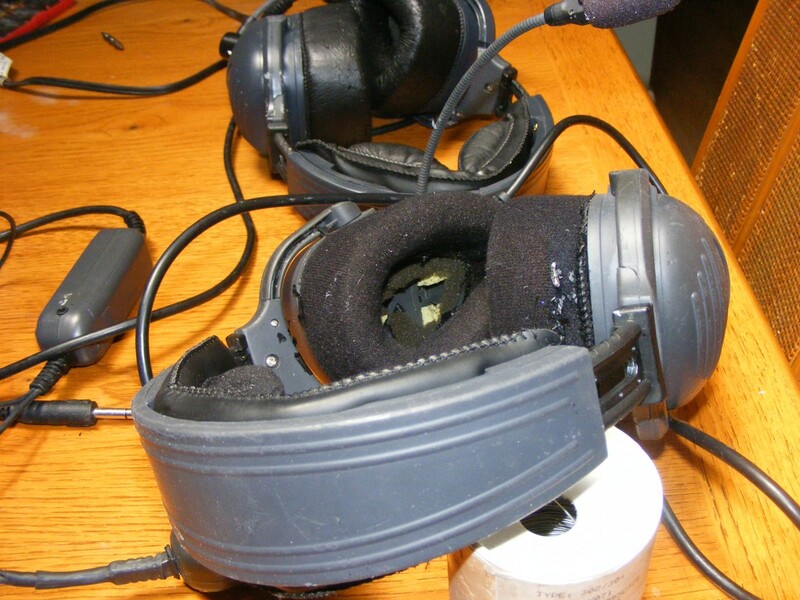 Here is my other 20 XLC headset which is the one that got the wires repaired last week. 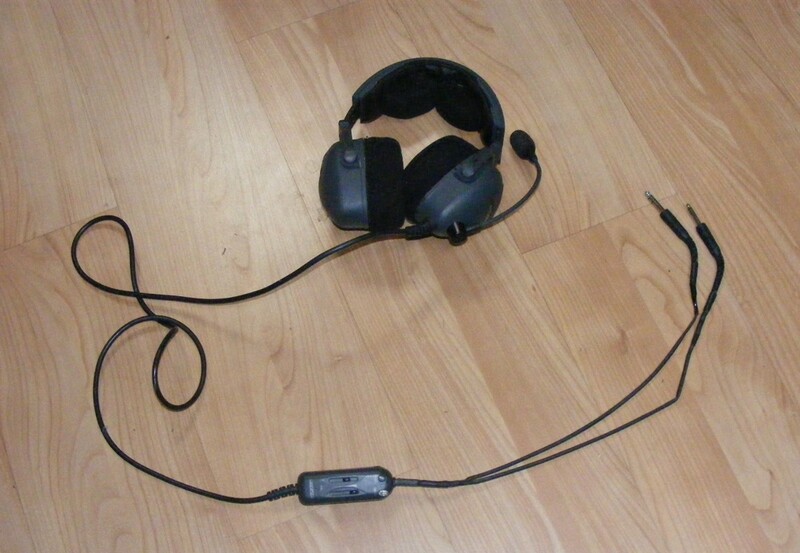 I have used this headset since September 2005. All the shiny black plastic thin film has worn off the headset ear muffs. 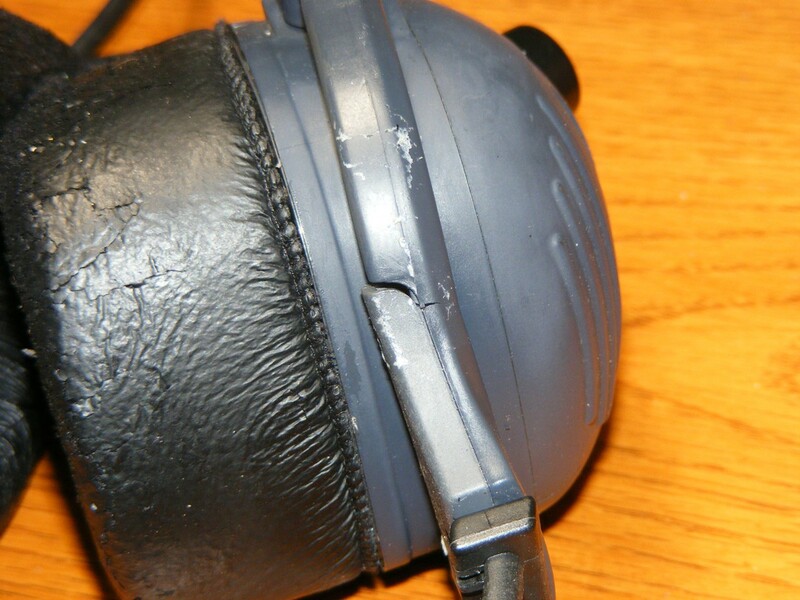 The foam liner that covers the speakers has also deteriorated on one side. I will contact Light Speed to get new cups. You can see the other set in the back ground where the "shiny" surface of the muffs has not worn off yet. 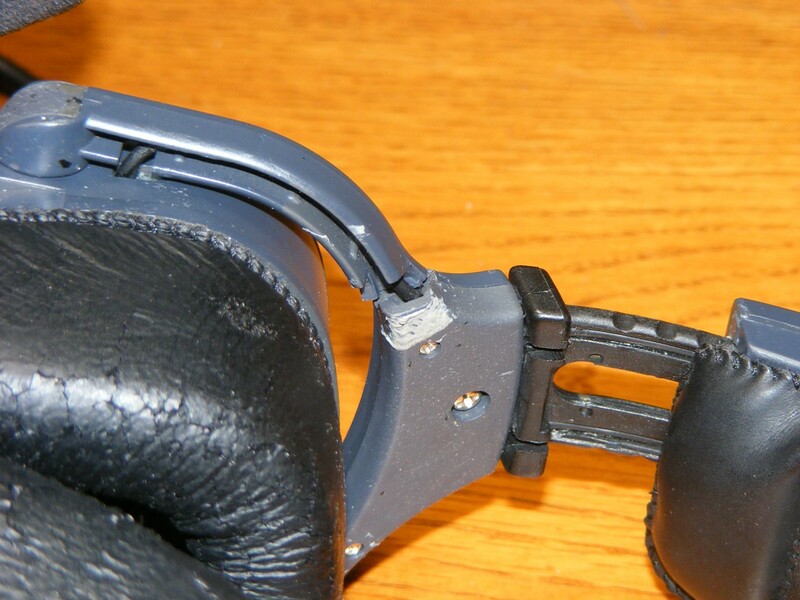 That other headset has more mechanical problems I read about online from other users with this model headset. The stirrups can be replaced by the user. One entry on that page indicated the replacement parts are thicker to resist the type of failure seen below. Both the LEFT and RIGHT sides of the headsets are broken the same way. Being from the south, I tried duct tape with no satisfaction. It is 90 degrees outside and a good day to work inside on this web site. July 3, 2017: Monday morning and with the sun rising in the sky, I wanted to try some photo tests with both of my digital cameras. I purchased an 8-inch square "Solar Lite" polymer sheet which allows cameras, telescopes, and binoculars to look directly at the sun with no damage to the optical image sensors in the cameras and safety for human eyes. I have seen this shiny silver stuff on cameras of amateur astronomers any time there is an eclipse of the sun. Here are a couple of test images from my Canon Rebel XT EOS with a 300 mm zoom lens using a modified 58 mm skylight filter that now includes the Solar Lite Polymer filter sheet. I cut out the filter size needed last night and put it between the glass and the retaining ring in the filter assembly I also have a 55 mm skylight filter and gave it the same treatment, but reversed the shiny side of the polymer sheet. 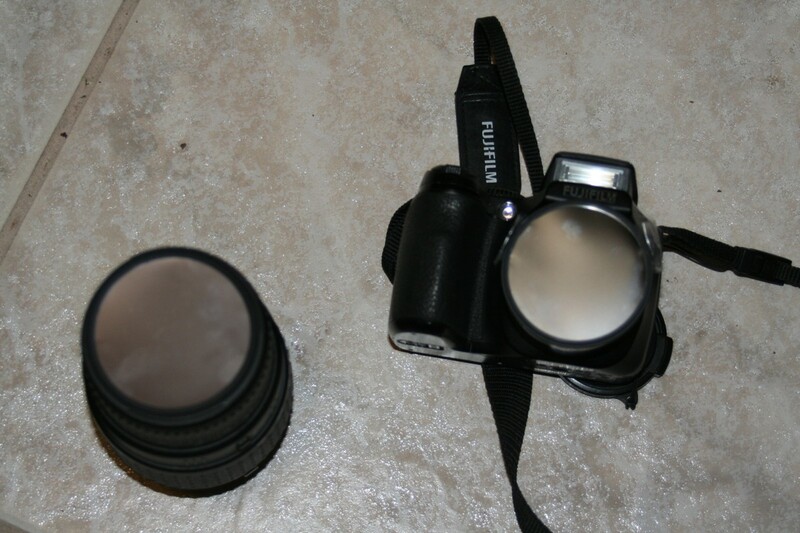 I used this reversed filter to go in front of the lens on my FujiPix S700 camera. That little camera accepts 46 mm threaded filters, but the 55 mm filter REVERSED can fit the front of the S700 lens assembly and is taped in place as seen in this image below. The rule is the shiny side toward the sun. 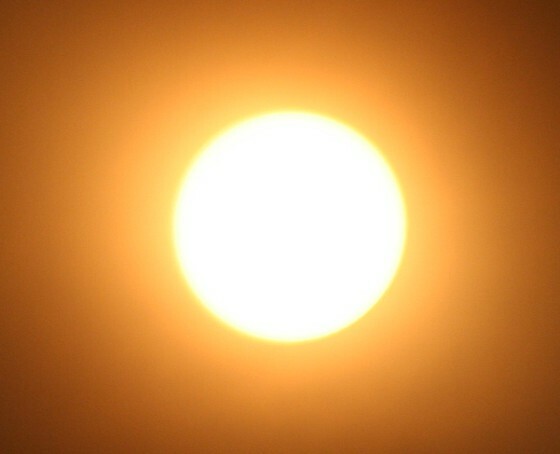 The Solar Lite filter has the equivalent of 15 f-stops in camera settings. That much attenuation equates to 1/1000th of 1% of the light from the sun getting to the camera sensors and it is safe for your eyes. 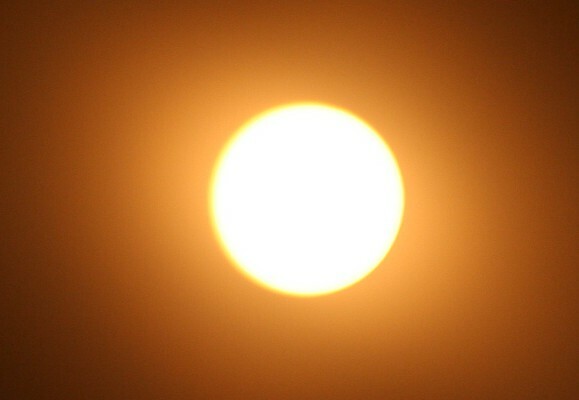 Here are the four photos I selected from solar photo tests this morning. The first pair are from my FujiPix S700. The image on the left was taken with the camera on a tripod. The image on the right is hand-held with the S700 camera. When you look through the view finder, the sky is completely black except when the sun is in the frame. These images were cropped to fit this page and no other photo processing was done. There was a thin layer of clouds up there. I hope to get a better opportunity later today with a clear sky. The zoom feature was at maximum. 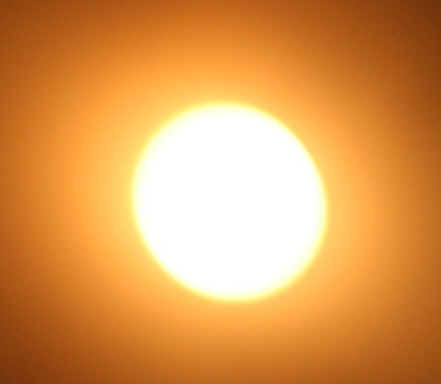 Here are a pair of images taken with the Canon Rebel XT EOS with a 300 mm zoom lens and solar filter as seen in the camera images above. The tripod shot on the left is good and the hand-held shot on the right shows how the camera moved during the exposure. I won't have a tripod in the airplane, so I will take plenty of photos and select from the best. 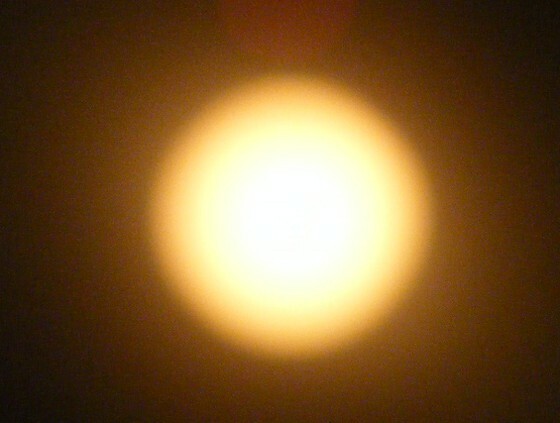 I also cut some Solar Lite filters to fit the front lens of my 7x35 binoculars and they worked fine also. Here is the template I used to cut my different sized filter sheets. The large circle is 6-inches in diameter and will be used on my telescope. The two small circles are 1.5 inches for the front of my binoculars. 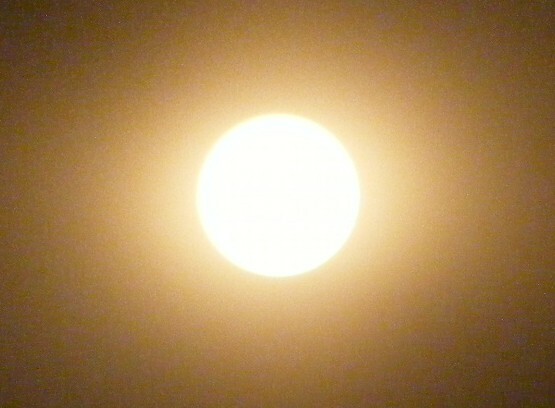 The two circles at the bottom fit the 55 mm and 58 mm filters for use on the front of camera lens. I have enough Solar Lite polymer sheet to make up a pair of eclipse sun glasses or for another camera lens. Weather permitting, all this stuff will be used during the total solar eclipse that will occur on August 21, 2017. I confirmed that I cannot use my video camera mounted in the airplane except for ground images of the shadow of the moon during the eclipse of the sun. Monday, July 3, 2017 at 2 PM and the sun is "shining" brightly, but there is a layer of HIGH cirrus clouds as a veil. I hope to have some clear blue sky shortly. This is Florida: If you don't like the weather, wait a few minutes, it will change. Just after 3 PM, I managed to get the image on the LEFT below by hand-holding the Fuji camera with anti-shake feature turned on. This is essentially what I saw through my telescope earlier this afternoon. The zoom was set at maximum as it was early this morning. No clouds were in the way for this photo. Yeah, I know, I could have used a flash light in a dark room, but that really is a photo of our THERMO NUCLEAR power source for the entire planet and beyond. We shall see if I can get a couple of shots of this ball of fire with the moon passing in front of it on August 21, 2017 somewhere over middle Tennessee. The image on the RIGHT was hand-held using the Canon Rebel XT with the 300 mm zoom lens all the way out taken at 3:34 PM. The Canon does not have anti-shake built-in like the Fuji S700. Enough tests, I know what to do during the total eclipse of the sun.